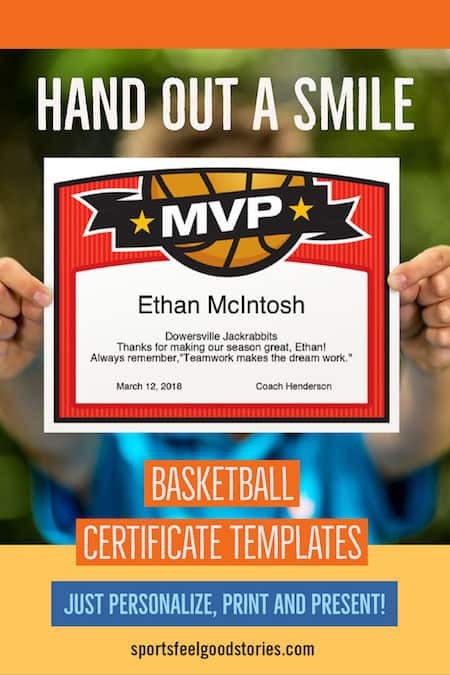 This Elite Basketball Award Certificate Templates collection features 25 designs for youth basketball – good for both boys and girls basketball teams. Be the star of your season-ending banquet with these stylish certificates! You’ll receive a digital PDF file that works on Macs and PCs enabling you to type in name, team name, coach’s name, words of praise, and other details in the text fields. Cool and contemporary design to these templates. 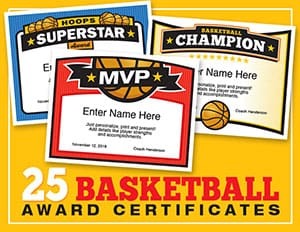 Just personalize, print and present the award to a basketball player or coach. Reward players, coaches, and even your scorekeeper. 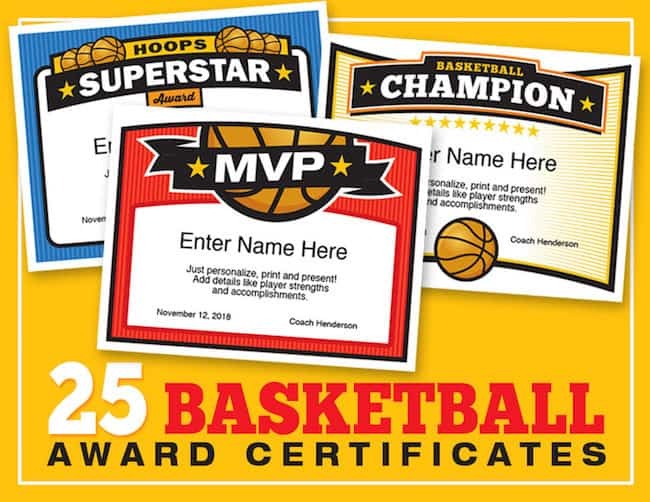 You may choose to include a fun basketball quote or slogan on the certificate. Good coaches find ways to identify and call out the best that each player has to offer. Take an extra moment and consider what would be the best words for each award. Personalize the text from “Enter Name Here” and below. Incredibly easy to use. What you see is what you get when filling them out.. The black text fields below the title are editable so you can personalize to each player on your team. They look great! Professional art director and designer Greg Johnson created designs that players and parents will be proud to display for a long time. Works on Macs or PC’s. Print as many as you like, year-after-year. Use these certificate templates year after year for your personal use. They are great for season-ending banquets. Create a player keepsake that will go up on the refrigerator or bulletin board and be remembered for a long time. The best way to provide some recognition to players is to call up each individually. Spend a minute and read out the words of praise you’ve added to each certificates. That’s a winning formula for players and their parents. Encourage parents to clap at the end of each certificate presentation. Some coaches might choose to use the full array of certificates and award different certificates to different players. Others choose to use the same template and just make them different with the names and words of praise. Remember you can use these certificates year after year with team after team. Present a certificate that will put a smile on a face!